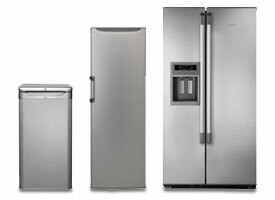 Experts from Team Knowhow, at Currys PC World, can repair most brands of fridges, fridge freezers or American style fridge freezers including Bosch, Samsung, Hotpoint and Zanussi. To book a repair you can call our friendly team of advisers on 0344 561 0018. You’ll pay one fixed price charge which includes the call out to your home, labour and parts. We offer a "no fix, no fee" repair which means that if we find that your fridge freezer is beyond economical repair*, we’ll give you a full refund. All fridge freezer repairs are done in the comfort of your own home on a day to suit you. We have a team of repair experts nationwide, who are available 6 days a week, across most of the UK. On the day they’ll give you a ring to let you know they are on their way. Our one off repair comes with a 12 month guarantee on the problem we are coming to fix, but we also offer an Expert Repair service with 12 month’s protection against other faults including general breakdown. Is a faulty fridge making you lose your cool?